I have always wanted to host a Alice in Wonderland tea party because the creative possibilities are endless. After rereading the book, I was convinced it was a mad but grand idea and decided to pursue it. I found inspiration in the most unlikely of places–in a recycling pile in the garage! I spied a big box that once housed a new bicycle and decided to re-purpose the box back to its former glory as a tree. This 3 ft. tall tree became the centerpiece for an Alice in Wonderland themed tea table in an upcoming tea fundraiser event. I constructed the tree using cardboard, construction paper, paper, wire, and acrylic paint. Each side of the tree depicts a moment from Alice’s Adventures in Wonderland. I wanted my guests to see something different no matter where they were seated at the table. With the tree ready to go, I started setting the table itself. To pay tribute to the Queen of Hearts and her subjects, the napkins on the table were black or red and folded as one of 4 card suits: heart, diamond, spade, or club. I also scattered playing cards all over the table. The napkins were black or red and folded as one of 4 card suits: Heart, diamond, spade, and club. 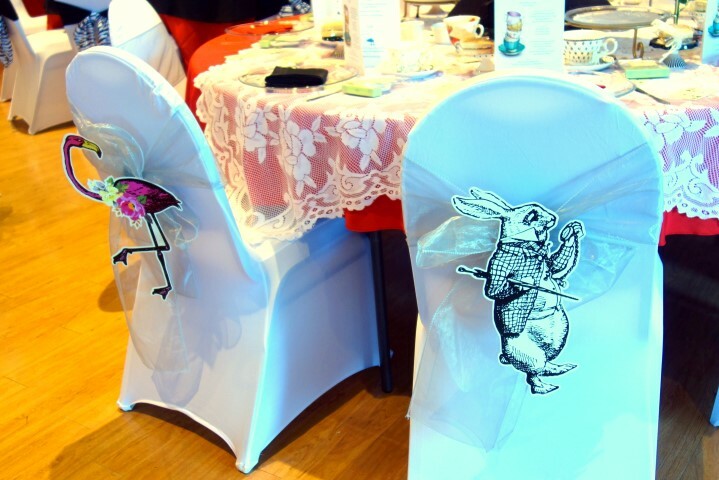 The decorations on the backs of the chairs were from the Talking Tables Truly Alice party prop set. They were great for hiding imperfect bows but also added to the whimsy of the table. There seemed to be no use in waiting by the little door, so she went back to the table, half hoping she might find another key on it, or at any rate a book of rules for shutting people up like telescopes: this time she found a little bottle on it, (“which certainly was not here before,” said Alice,) and round the neck of the bottle was a paper label, with the words DRINK ME beautifully printed on it in large letters. How I wonder what you’re at? Dormouse–this little guy is at least 40 years old! This entry was posted in Autumn, Cute tea things, Fundraisers by Henni. Bookmark the permalink. Brava! Wonderful Wonderland and quotes therefrom. Glad I first had in “work-progress” previews.